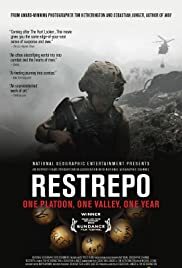 BEFORE: Tying in with both the United States and 9/11 themes,Restrepo goes overseas and in depth with some of our nation’s finest. Restepo did win the Grand Jury Prize for best documentary at Sundance so I expect it to be much more entertaining and factual than last night’s train wreck. AFTER: Restrepo felt like a typical war film along the lines ofSaving Private Ryan or something like District 9 with the soldier interviews. The difference with Restrepo is everything is real. This documentary chronicles the fifteen month deployment of the 2nd Platoon of Battle Company as they expanded out in the Korengal Valley, also known as “The Valley of Death”. In the documentary it’s said that over 70% of the ordinances used in Afghanistan were used in this valley and it is normal to be shot at at least once a day. You see everything in this documentary from the triumphs to the defeats. Nothing here is squeaky clean; you see the atrocities and the pain these soldiers are put through. But you also see the down-time; the time where the soldiers just be themselves and let loose. To me, it was so shocking to see how someone could go from joking and fooling around with their friends, almost as if they didn’t have a care in the world, to going out on the battlefield and watching those same friends die. It just gives me even more respect for what our soldiers do to protect our country. What I like most about this documentary is this would have made a pretty good fiction film or even a based-on-true-events film. The story has a beginning, middle, and end with conflict and resolution. Protagonists and antagonists battle for control of a highly contested and vital area in Afghanistan. But what really puts this over the top is that everything you see actually happened. No visual effects, no stunt doubles, no fake weapons or explosions. No. Everything is real. And thinking about that is why Restrepo is such a great documentary.